The LARP Dane Axe is a classic reproduction of a historic Danish axe, recreated in battle-safe materials. 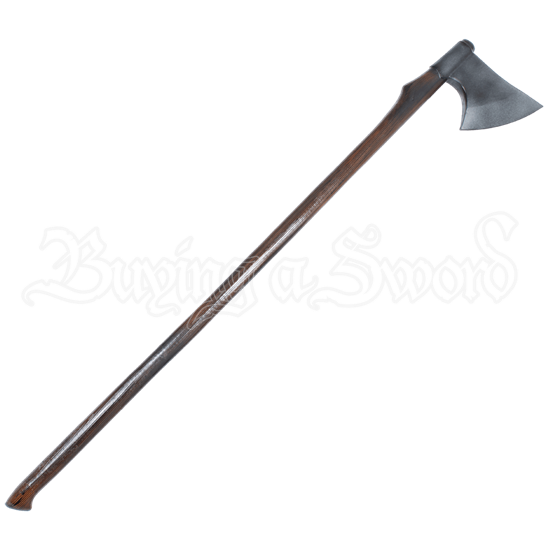 What separates a Dane axe from other axes is that the Dane axe features a small, narrow bit and head mounted on a long shaft, making it superbly designed for powerful, cutting blows. This Dane axe is made from durable foam that does not shred and is sealed with a strong coating of latex. As safety is always an issue in LARP, this weapon is also made utilizing a fiberglass core capped with a strong, Kevlar tip for added protection. The pole has a wooden look to it, and, like any wood handle, its color may vary from light to dark brown. As this weapon is handmade, its measurements can also vary slightly from what is shown below. As this weapon is handmade, its measurements can also vary slightly.